Home information: Gerald is growing up in the village of Bugoi in rural northeastern Uganda. He and his siblings are being raised by their grandmother; their parents abandoned them. Gerald has one brother and two sisters (he is the second born). Her grandmother is a widow and cares for the children by herself. She supports their family by “digging”—she grows maize and beans to eat and to sell at market when possible. However, she struggles to meet all of their needs, especially school fees for the children. Gerald’s most immediate need is education. He helps at home by sweeping. School information: Gerald has been able to attend a government school up to primary grade 2, but his family is struggling to continue his education. 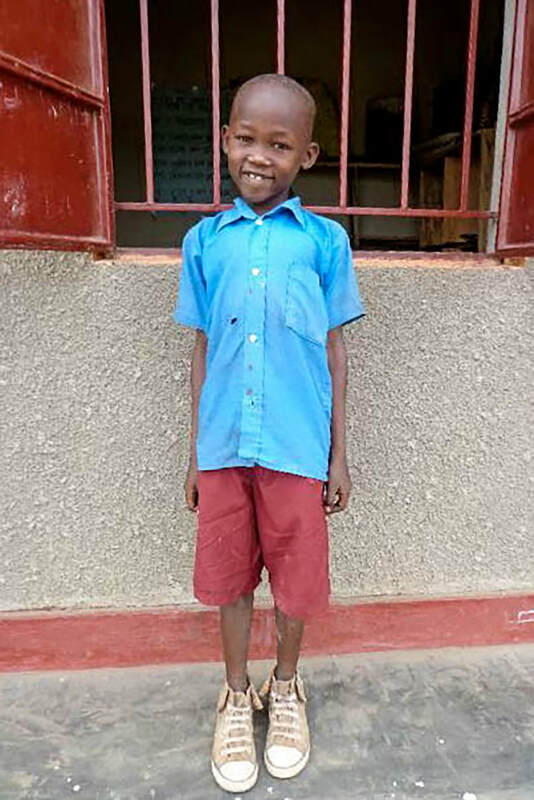 With sponsorship, he will join the Bugoi Haven of Hope Nursery and Primary School, where he will be placed in the appropriate grade for his age and learning level. In Uganda, nursery school lasts for three years and is followed by seven years of primary school and six years of secondary school. At the Haven of Hope school, Gerald will learn and play, be taught about God, and receive meals and medical care. His older sister Jackline was recently sponsored, and they look forward to attending school together. Prayer requests: Pray that Gerald will thrive in school and come to know and love God.